Our school is a member of Krav Maga Universal, under the direction of Ernie Kirk, and recognized by the Wingate Institute in Israel. 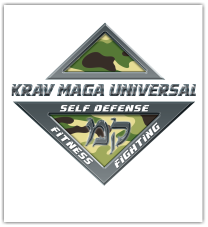 Krav Maga Universal (KMU) was started in 2010 and is affiliated with the Wingate Institute in Israel. KMU is one of a handful of organizations in the United States recognized by the Wingate Institute. KMU provides standardized testing requirements for advancement that are recognized by the Wingate Institute. Also provided are instructor certifications, various seminars and training camps. Krav Maga Universal was developed to improve and advance defensive tactics for all individuals interested in self defense. Ernie Kirk is the Chief Instructor for Krav Maga Universal. He holds a 3rd Degree Black Belt in Krav Maga and is a certified Senior Instructor through the Wingate Institute in Israel. Wingate is solely responsible for providing self protection instructors to all combat Israeli Defense Force (IDF) units. Ernie Kirk is the only American instructor recognized by Wingate with the authority to certify others using the Wingate curriculum. Ernie was among the first group of US citizens to become a licensed instructor in 1997. He was the first person from this group to become a “Train the Trainer” instructor and the first to receive his Krav Maga Black Belt. He was formerly Head of the Advisory Board for Krav Maga Worldwide. Ernie has trained with top Krav Maga instructors from all over the world. He routinely travels to the Wingate Institute in Israel for advanced training and certification. Ernie is a former schoolteacher who has been training in the Martial Arts for over 30 years. He is a Sixth Degree Black Belt in Tae Kwon Do and Hapkido, a Black Belt in Goju-Kai, Combat Karate and Judo and holds an advanced brown Belt in Aikido. 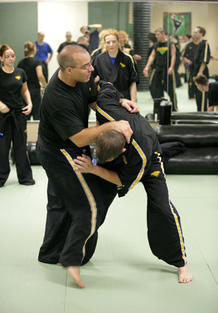 Besides having Kickboxed for 15 years, he is also experienced with knife defenses and attacks, the kuboton and restraint and control techniques as used by various police departments. Ernie is a Certified Contact Weapon Defense and Control Instructor. He is trained in Tactical Pistol and Carbine, has worked extensively with military and law enforcement agencies in small unit tactics, room entries, downed vehicle tactics, techniques and procedures. He has also completed courses in Direct Action Denied Area Operations, Close Quarter Combat, and Hand-to-Hand Combat, Simunition Scenarios, Empty Hand-to-Weapon Transitions, Resistance Control and Handcuffing, Weapon Retention, Combatant Control and Control of Aggressive Subjects. Ernie has taught at numerous martial arts conventions, trained army rangers, US Air Force personnel, police departments from around the US, UK, Canada, Poland and Colombia, SWAT teams, Home Land Security, Secret Service, Air Marshals, and Tactical Officers Association. Recently Ernie has been contracted to teach at the Homeland Security Philadelphia office and also contracted to instruct the instructor cadre and military personnel at Fort Dix military base in New Jersey. Ernie Kirk's Krav Maga Universal curriculum has been approved and taught at the Air Advisor Academy for military personnel preparing to deploy to the middle east. Ernie has been featured on the Discovery channel, New York times, Blind Date and worked on the television show HACK.